Debra Denise Hampton has been a San Diegan since birth. In 2015 she was working as a case manager for individuals placed in a program for drug and alcohol addiction. One day she started feeling a lump surfacing right underneath her left breast. “What is this!? 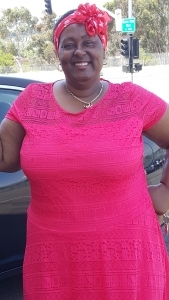 It kept hurting and then I started feeling it, it was a bump, but it felt more like it was in my rib cage.” Debra got a mammogram and ultrasound, and then a biopsy. On March 19, 2015 – one week after that – she was diagnosed with Stage 2 breast cancer. She was beyond shocked – since there was no family history. She left work immediately, and called her family.“I just couldn’t stop crying,” she said. “I asked God, why? What did I do? Then I thought about it and I shouldn’t say why, but whatever it is let me be able to get through it.” Debra has always been outgoing and giving. But she had never had to ask for help herself. “I’m always used to giving help, so I struggled.” Debra’s birthday was on March 22, just two days after she was diagnosed. She originally planned a trip with her husband to celebrate, but all she could think of was the next step. “The whole trip was spent crying and praying.” During her follow-up appointment, her husband Romean and best friend Gale went with her to understand her options. In October 2015, Debra was invited to a book signing party, at that event she met fellow Wendy Shurelds, Susan G. Komen’s Community Resource Advocate for the Circle of Promise. Circle of Promise is a Komen San Diego initiative to bring breast health awareness and services to African American women. Since then, Hampton became involved as an advocate and volunteer for Susan G. Komen San Diego’s Circle of Promise. If you would like to learn more about COP and become an advocate in your community contact Wendy Shurelds or visit our page. Komen San Diego helps breast cancer patients stabilize their lives during crises and provides limited, temporary financial assistance, meal deliveries, free mammograms, transportation assistance, patient navigation and more! For more information visit our website or call us at (858) 573-2760.